News: "I don't want to go where I'm not wanted," says architect Frank Gehry as his design for a performing arts centre on the World Trade Center site in New York is dropped. Gehry's vision for a cluster of rectangular forms at Ground Zero were reportedly dropped last week, following almost 10 years of development, and the 85 year-old architect will no longer be involved in the project. Of all of the designs within Daniel Libeskind's 2003 masterplan for the Manhattan site, the $400 million performing arts centre had made the least progress, due to fund-raising issues and delays caused by a transport hub by Santiago Calatrava being constructed underneath. The board of the performing arts centre plans to instead select an architect from the competition's original finalists. Speaking to the New York Times, real estate developer and board chairman John E. Zuccotti said: "We're in the process of selecting a new architect. Three architectural firms are being considered." The nine contenders being considered for the final three include site masterplanner Daniel Libeskind, Rem Koolhaas' OMA, Rafael Viñoly, Moshe Safdie and Tod Williams Billie Tsien Architects. 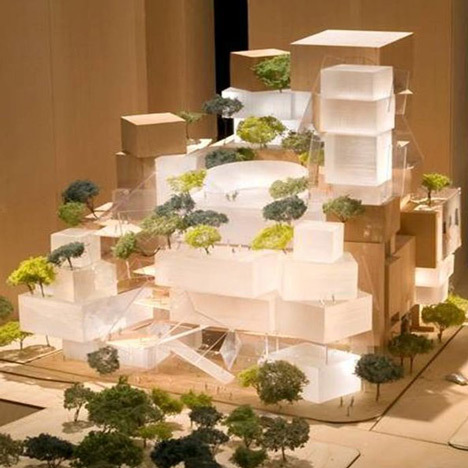 Responding to the decision, Gehry said he felt the board was moving in a new direction and that centre president Maggie Boepple — appointed in 2012 — did not appreciate his work. "She says I build models," he said. "She doesn't have a clue as to what I do or how I do it. It's fine. It's a new group. They should do what they want. I don't want to go where I’m not wanted." Boepple declined to comment on the architect's statement, but said: "When the design architect is chosen, we know exactly how we want the interior of the building to work." Gehry's design featured a series of stacked and overlapping box-like forms, interspersed with trees and accommodating three theatres. The brief is now understood to reduce the size of these stages.